Villains: Lord Hellebore, George Hellebore, henchmen. Before the name became a legend. Before the boy became the man. Meet James Bond. 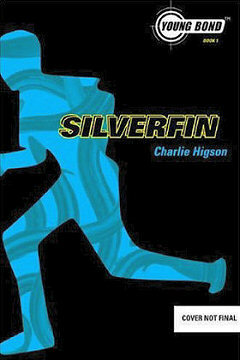 SilverFin - the first Young Bond title by Charlie Higson. Get to know the teenager who became the world's most iconic spy. With an authentic '30s setting and meticulous research, Charlie Higson has created a teenage James Bond who is absolutely true to Ian Fleming's creation. There is action, adventure, a terrifying villain and, of course, a beautiful girl. This thrilling prequel to the James Bond dynasty shows young James at boarding school at Eton in the 1930's, where he spent his formative years. Acclaimed British writer Charlie Higson, with the Ian Fleming Estate, writes an edge-of-your seat thriller that brilliantly plants the seeds to show how young James learns the skills that will eventually make him history's most formidable and suave super spy. 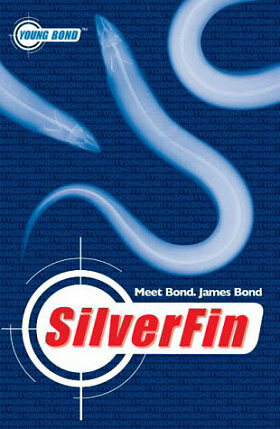 The dark waters around a Scottish castle hold a sinister secret... SilverFin. 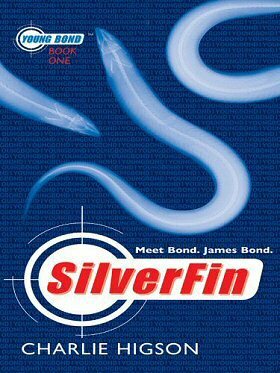 SilverFin is deadly. 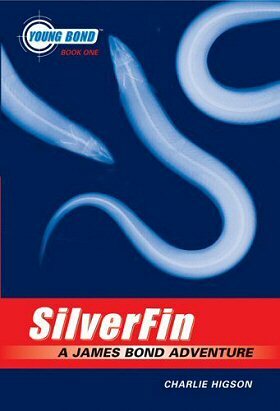 SilverFin is the future. One man with a thirst for power will use it. whatever the cost. One boy stands in his way. His name is Bond, James Bond. A young impressionable James Bond sets out on his latest advantage in this new series of Young Bond books. After losing both his parents to a climbing accident, James Bond is left with his aunt Charmain who has been his guidance and teacher. James arrives at the highly prestigious Eton for his first year of school. Quickly becoming accustomed to the tradition and rules that keep Eton running smoothly, James makes friends with ease. However, when he is confronted by a notorious school bully, George Hellebore and his father (and Eton patron) Randolph Hellebore, things take a turn for the worse. Above: 1st edition Miramax paperback (USA). Above: 1st edition Miramax hardback (USA). Encouraged by his sports teacher Mr Merriot to enter a cross country race, James catches George and his father cheating to win the race, and after beating the Hellebore's at their, George suffers the wrath his father and further sets the two boys against each other. With the school year coming to a close, James heads home to his aunt and uncle's house in the highlands of Scotland where his advantage truly begins. On the long journey to Scotland, James meets Red Kelly - a street wise Londoner who is a couple of years his senior. Red is heading to Scotland to help his family look for his missing cousin Alfie. James comes to Red's aid as they board the train, and the favour is returned when James runs into George who is also traveling to Scotland to the Hellebore's castle. Upon returning to his aunt's house, James spends time with his ailing Uncle Max, and learns of his role during the Great War as a spy. Max teaches James the virtues of fishing and helps James discover the joys of driving. Young James falls in love with his first car which he later inherits from his uncle. James agrees to help Red look for his missing cousin, Alfie Kelly, and while investigating the young boys run into a several memorable characters, of which Wilder Lawless and her horse Martini are two. They come to James' aid when escaping Lord Hellebore's castle and make a lasting impression on both James and Red. Soon the two boys make a disturbing discovery about George's father and his secret work at the castle and its effects on the wildlife in the adjacent loch Silverfin. It soon becomes apparent that Lord Hellebore has become delusional and is up to no good developing a new super solider serum named Silverfin. Randolph approves the test of the serum on this family and any adventurers who stray too close to the Hellebore residence. After discovering how twisted Randolph has become, James and Red break into the castle. Red breaks his leg and leaves James to go it alone. James is captured and learns of the true horrors of Lord Hellebore's scheme, and convinces George that his father's plans are evil, and both boys work together to destroy this surreal project. A man stood there glaring at him and, despite the fact that he was short, shorter even than some of the boys, he has an air of self-importance about him. "It's a marvelous thing, the internal combustion engine," he said, gazing lovingly at the oily block of metal. "It's going to change the world." "I'm a detective. From the Pinkerton Detective Agency in America." "We never sleep!' said James. "That's your motto, isn't it? 'We Never Sleep.' I've read about Pinkerton's. "That's right," said Meatpacker. 'We Never Sleep'"
"Damn you, boy!" bellowed the lord. "Damn you to hell. You have caused me a great deal of trouble, and before I kill you I'm going to thrash every scrap of skin on your body." James spat at him and got him right in the eye. Above: Draft artwork for the American hardback edition. This was later replaced by a version based on the British cover. 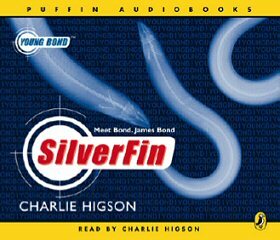 Author Charlie Higson has narrated the abridged SilverFin audio book on CD (cover art opposite). 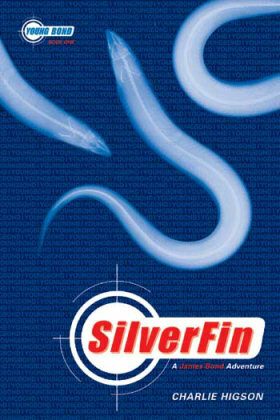 The SilverFin audio book is priced at £12.99 (RRP) and is available in the UK. 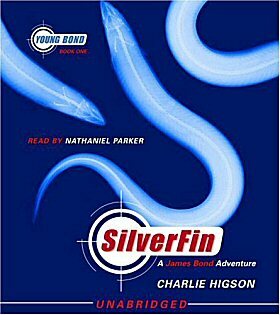 English actor Nathaniel Parker narrates the USA edition of the SilverFin audiobook. Unlike the UK edition, the US release is an unabridged edition. The CD retails for $37.00 (RRP). Right: UK (above) and USA (below) cover art for the respective audiobook releases.